Welsh Rabbit or Welsh Rarebit, it doesn’t matter which name you know it by-it just tastes good! The recipe for this substantial snack dates back over one hundred years and remains popular with all ages today. Pour the measured milk or beer into a heavy-based saucepan and place over very low heat.As the liquid begins to warm, add the grated cheese and mustard powder.Season the mixture with salt and pepper to suit your taste. Stir gently until the cheese melts and the mixture is smooth and creamy.Next, beat in the egg yolk (or butter) and continue to stir the mixture over very low heat.The bread can be toasted in a toaster. Spoon the cheese mixture onto the toast and place under a hot grill.When the toasted cheese on toast is bubbling and golden (slightly browned if you prefer it like that) it is ready to serve.Eat as it is or with a green salad and grilled tomatoes. This is a variation of the above recipe. Cook as before but place a lightly poached egg on top of each slice of Welsh rarebit-as you cut into it, the yolk runs over the cheese mixture to give a rich golden orange colour and a wonderful combination of flavours and textures. This is a more elaborate version of the traditional Welsh dish. Although the cheese mixture is prepared and cooked in the same way, the toast is soaked in red wine before the addition of cheese. Again, with this dish, the cheese mixture is the same as the Welsh and English versions, but, the Scottish version is browned on both sides before being placed on the toast. You can do this by grilling the cheese mixture in a shallow heat-proof dish then, turning it over in the dish to grill the other side. Then, when both sides have browned, add it to the toast and serve. Welsh Rarebit is good on its own. Served with salad and tomatoes, it becomes an acceptable light lunch or supper dish. With a poached egg on top it becomes a little more substantial, but when served with cold ham and baked beans it becomes a meal on its own! If you are spending a day outdoors in cold weather, Welsh or Buck Rarebit makes a warming and satisfying breakfast meal. Serve it as part of a cooked breakfast with crispy bacon and grilled tomatoes and a mug of hot tea or coffee. It also goes particularly well with poached smoked haddock. Fuel for the day...This is a simple dish that people of most ages can enjoy-try serving it with different accompaniments to suit the tastes of your family. Welsh Rarebit with tomato soup is a winner for kids on cold evenings after school.Red Leicester cheese does the job just as well as Cheddar and gives a change of colour. Try making your Welsh rarebit with different cheeses, add some finely chopped onion or chives if you fancy, a sprinkling of fresh sage in the mixture appeals to some people. For extra colour and zing try it with some cayenne pepper.However you prepare your own dish of Welsh Rarebit, you will appreciate what a simple and versatile dish it is.Tuck in! 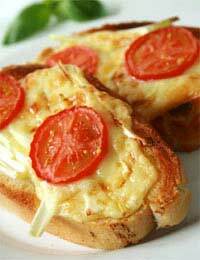 This is lovely recipe, I added extra cheese and french mustard and this was top rate. Try this.